This was our first experience with a houseboat on the Hawkesbury River and we were pleasantly surprised at how easy and comfortable it was. We were lucky with the weather which would obviously help a lot. We chose an eight berth houseboat mainly to be able to accommodate a wheelchair. Our houseboat was called the "Skydancer" and had ample room in floor space. There were two large sitting areas - one downstairs and one on the upper deck - both covered. The Upper deck also had a BBQ for convenient cooking. downstairs had a good size kitchen, gas stove, crockery, cutlery and a separate small dining area. The bathroom was a good size for a houseboat and had a good hot shower. There were two private bedrooms with double beds and storage space. The beds were not overlarge and there was minimum floorspace. The back of the boat had an area for the boys to fish from which kept them happy. We hired the linen which proved to be a good decision as it was all in place when we arrived and saved us the hassle of carting it to and from. We bought ice for the big esky at the Marina and it kept cold for the whole period we were out there.The boys were also able to get their bait there. On the negative side there are no 240V power outlets - so no computers or hairdryers and water had to be conserved. I was saved by having a 16V charger cord for my iPhone and iPad which could be charged up at the control desk on the houseboat. 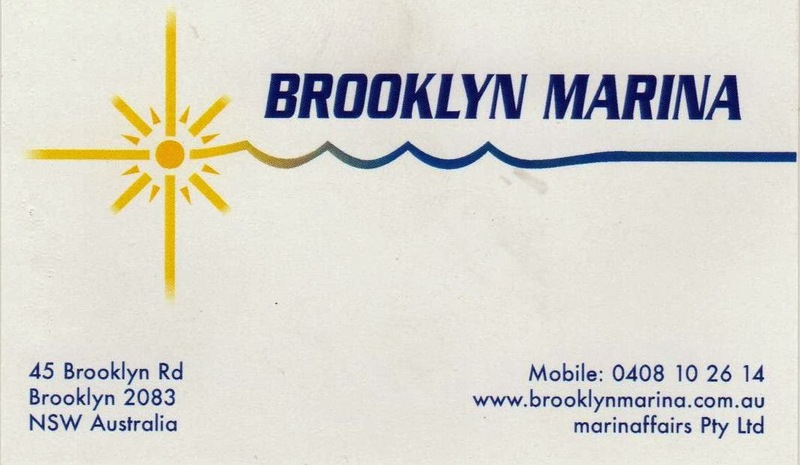 The staff at the Brooklyn Marina were very helpful assisting us with the wheelchair and one of their staff will take the houseboat from the mooring at the Marina out to deep water where we could take control without having any hassles. We were also given an instruction tour of the houseboat and given maps of the area and advice for the best places to go for our 2 1/2 day excursion on the river. At the end of the trip a staff member will come out to the houseboat and take control to bring the houseboat back to it's berth. We just had to telephone them when we were ready to come in. 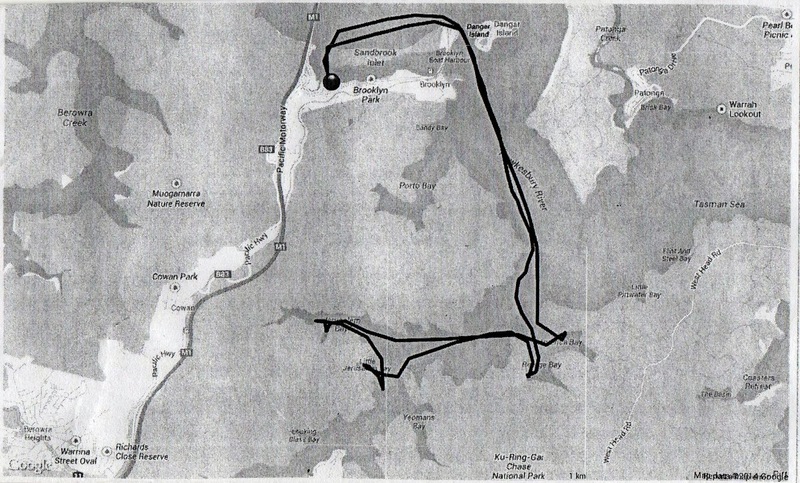 The house boat is GPS charted so the staff know at all times where we are in case of emergency or getting lost and we were given a copy of the trace map of where we had been when we returned (see photo above). This was interesting to look at as when we were out on the water we did a bit of guessing of the bays and marinas that we passed. There are some 400 moorings throughout the river system so it was not hard to find a mooring to fish or to lock down for the night. We did not have to use the anchor as there was multiple choices of moorings available - being mid week. I would imagine that the weekends and holiday seasons would be a different story. The scenery was magnificent - beautiful unspoilt bushland and miles and miles of water to explore. Our boys were keen fishermen and did manage to catch a few nice fish although the "Big One" eluded them. It was a very peaceful few days, very quiet and the mild movement of the boat tended to lull me to sleep so it was a very restful experience. The Internet was available on my iPhone and iPad but fluctuated so lengthy connections did not happen. It all worked better from the Upper Deck and we could stay in touch with the rest of the world if we wanted to. There was a radio, CD and DVD player on board. My overall impression of the houseboat was a good one. We had four people on board which was okay, but I think eight people would need to be very good friends and be able to put up with cramped space and only one bathroom and limited water and battery power. We found the houseboat easy to manoeuvre once we got the hang of it and we all had a turn at the wheel. We were very lucky with the weather - we had no wind and no over hot days. An electrical storm closed in as we were bringing the houseboat back to berth and we had to unpack in the rain. We had a few light showers when we were out on the water but we had plenty of covered area so that was no worries. 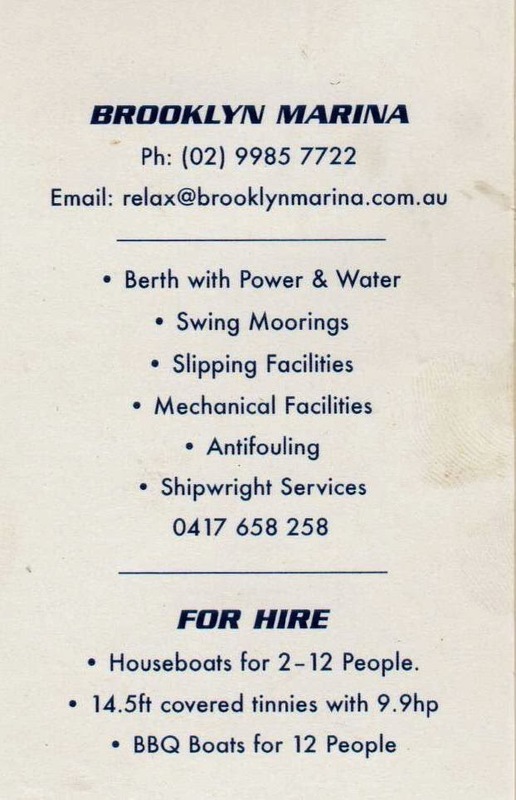 I would certainly recommend hiring a houseboat on the Hawkesbury River if fishing, peace and quiet are your thing. There is a dingy with the houseboat and if you wish you can hire a motor to go ashore to the little beaches, big Marinas and restaurants. We did not do this as fishing, peace and quiet were on out list as we only had a short excursion.